After all the calamities and events that happened in our country there were many inspiring stories that we saw or heard from an individual or groups that have joined hands to help fellow Filipinos . Because of this unforgotten winning acts that are done selflessly in the country this year, Medicol Advance would like to thank and pay tribute to these people who have gone out of their way to help other people and communities. 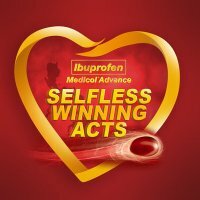 From October 12 to November 6, 2009, Medicol Advance is inviting us to nominate individuals or groups of individuals that have truly exemplified selfless winning acts in 2009. You just have to visit Medicol Advance’s facebook page and share the inspiring story of a person/group you wish to nominate. Medicol Advance will donate P10,000 worth of grocery and personal care items plus P10,000 worth of Medicol Advance to the beneficiary/community of the nominee’s choice. , for FOUR (4) weeks, Don’t worry because the nominator will also be given gift certificates, which they can also use to reach out to help other people in need. This is the first of Medicol Advance’s upcoming efforts to pay tribute to Selfless Winners of our country today. Medicol Advance is from the makers of Medicol. 6. This advocacy is open to all Filipinos with beneficiaries from anywhere in the Philippines, 18 years old and above.